Mermaids Millions is an aquatic-themed video slot machine with 5 reels, 3 rows and 15 paying lines where you can score a big win of 7500 coins and additionally benefit from Wilds, Scatters, Free Spins and the Treasure Chest Bonus. 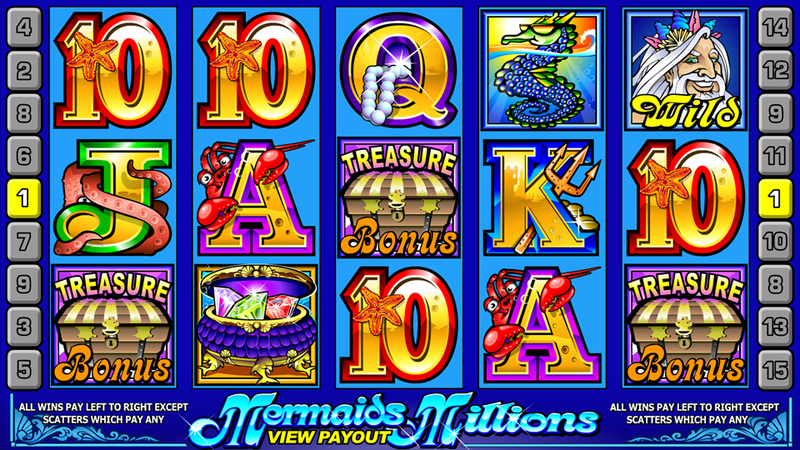 The Mermaids Millions slot review brings more details about the free play and the real-money mode and includes a few tips to help you progress on the paytable faster. We have no free play mode available yet, but take a look at the Mermaids Millions screenshots instead. Or why not simply giving a try with one of the recommended casino sites above? In terms of the gameplay, we have a classic slot machine that pays from the left for a combination of 3 or more matching symbols placed on adjacent reels. All icons are designed to match the main theme, so you will find the sea king Wild, clams and sea horse able to bring anything between 2 and 7500 coins. There is a chance to place bets from €0.01 to €75 on 1-15 lines with 1-5 coins ranging from €0.01 to €1. When get 3+ Mermaids placed anywhere on the reels, the Free Spins round will start with 10 rounds that cost nothing but can bring 3x multiplied winnings. Collect 3+ Bonus icons on an active payline to trigger the Treasure Chest Bonus feature. Basically, this is a mini interactive round where you get 12 objects packed with rewarding features and pick any to reveal the prize. Once you choose an empty object, the round ends and you’ll be back to the main game. You can improve the rating additionally if trigger this feature during the free spins round. Being powered by the Microgaming Quickfire platform that supports mobile gaming, this title will work fine on your Android or iPhone with all options, including demo, enabled from the start. 3. What is the RTP factor of Mermaids Millions? On the Microgaming-powered sites, the winners managed to score a jackpot of €37.500 with the RTP of 96.56%. It takes only a dime to start your quest for the underwater treasure. Even though the game has no special side effects, a chance to earn more than initially invested can surely attract recreational gamers looking for an amusing and rewarding environment.